No matter how much some may try to forget, Batman lives in two worlds. We eat up the dark, gritty Christopher Nolan style of Batman, with flaws and angst and moral ambiguity now, but fully-invested camp can be just as captivating. 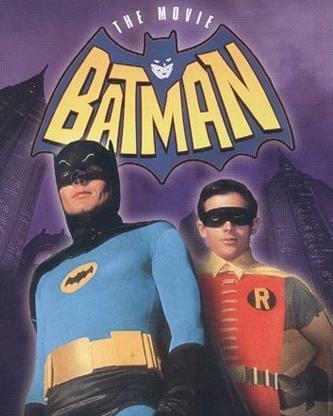 I’ve never seen the 60s Batman, but I hope to jump in with this movie. To be honest, I expected to see Batman and Robin first, but the opportunity for this came up and I took it. I invite you all to join me in this trip through absurdity. What can you say about this movie? There’s camp and then there’s camp. The opening sequence is so jam-packed with ludicrousness that by the time the shark blows up, you have to accept it. There’s not much I can reveal about the style that’s surprising. The costumes are cheap and loud, the dialogue is stilted in writing and delivery, and the plot is overblown. Surprisingly absent from most of the film is the usual “blamination” — the trippy onomatopoeia splashed over fight scenes. In this super-sized adventure, Joker, Catwoman, Penguin, and Riddler team up to steal a yacht carrying an unspecified world-changing invention as the United Underworld. The Joker is played much more manically than I’ve ever seen him, even in the animated versions, while the Riddler is much more subdued than I ever imagined. Meanwhile, Burgess Meredith interprets the Penguin splendidly, and I have yet to see Catwoman portrayed poorly (I haven’t seen Catwoman). In their audacious plan to kill eliminate Batman, Catwoman seduces and kidnaps Bruce Wayne as bait. For some reason, that doesn’t work. Nevertheless, Robin doesn’t attempt a rescue or anything self-starting like that, leaving Batman to make his own escape, as yet another setup to yet another action sequence, which is how I would describe the entire plot. Just a set of excuses for spectacle and laughs, which isn’t necessarily a bad thing. But what is their master scheme? Can Batman figure it out in time? Find out on your Bat-DVD, same Bat-Time, same Bat-Channel! Watch this movie: four words– Holy Cornball Adventure, Batman! Don’t watch this movie: if contrived escapes drive you batty.